Liege, Hendrik van den Hoven, 1597. 8vo. pp. 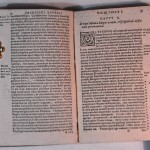 (viii) 317 (xi). Roman letter, historiated and floriated woodcut initials, woodcut Jesuit emblem on title page, fine engraved portrait of St. Francis Xavier within ornate frame on verso, manuscript ex libris ‘Stanislaus Kostlla de Stacpoole, 13 Nov. 1846’ on title page, ‘IHS Maria’ in early hand on fly. 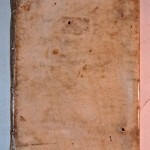 A very good, clean copy in contemporary vellum, a little soiled, lacking ties. 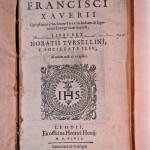 Third enlarged edition, first published in unauthorised form in 1594, of Torsellino’s important biography of the truly extraordinary St. Francis Xavier, one of the earliest and best sources for his life. St. Francis Xavier (1506-1552), “The Apostle of the Indies,” was one of the founding members of the Jesuit order and perhaps one of its most illustrious. He met Ignacio’s de Loyola in Paris at the university and was one of seven, including Loyola himself, who took the original Jesuit vows on the 15th of August 1534. He retained Francis at Rome until 1541, as secretary to the Society of Jesus, when John III, king of Portugal, decided to send a mission to his Indian dominions, and St. Xavier was chosen to lead it. On April 7th, 1541, he sailed from Lisbon with Martim Alfonso de Sousa, governor designate of India. For the next twelve years, essentially following the Portuguese trading routes, he preached from Goa to Malacca, then on to Japan and China with extraordinary success, leaving an organised Christian community wherever he went. In travel terms alone, this was a remarkable achievement. His linguistic, cultural and evangelical legacy in Asia was vast. Within thirty years of his arrival in Japan, there were close to 300,000 Christian converts. He died attempting to start a mission in China, and was buried in Goa. He was beatified by Paul V. in 1619 and canonized by Gregory XV in 1621. In six chapters, Torsellino’s work follows St. Francis’ life chronologically, concentrated almost exclusively on his Asian travels, and ends with a chapter on his miracles. Torsellino’s popular life of the Saint is valuable as one of the first European sources of information on Japan and the Far East in general. It contains not only an account of St. Francis’ exploits there, but also gives observations on the geography and location of the country, and on the character and manners of the Japanese, i.a. their language, religion, appearance, and cuisine. Stanislaus Kostlla was the 3rd Duke of Stacpoole who became a priest and domestic prelate to the Pope. During the French Revolution, he acquired the remains of Fontenelle Abbey where he lived until his death in 1896. He gave over the Abbey to the French Benedictines in 1893, where the order remains to this day. An excellent copy, with interesting provenance. BM STC Dutch p.199. Cordier, BJ. 128-9. JFB T144 . Not in Adams. In Early Books, Subjects & Interests Tagged Biography, Far East, Geography, Religion, Travel Bookmark the permalink.